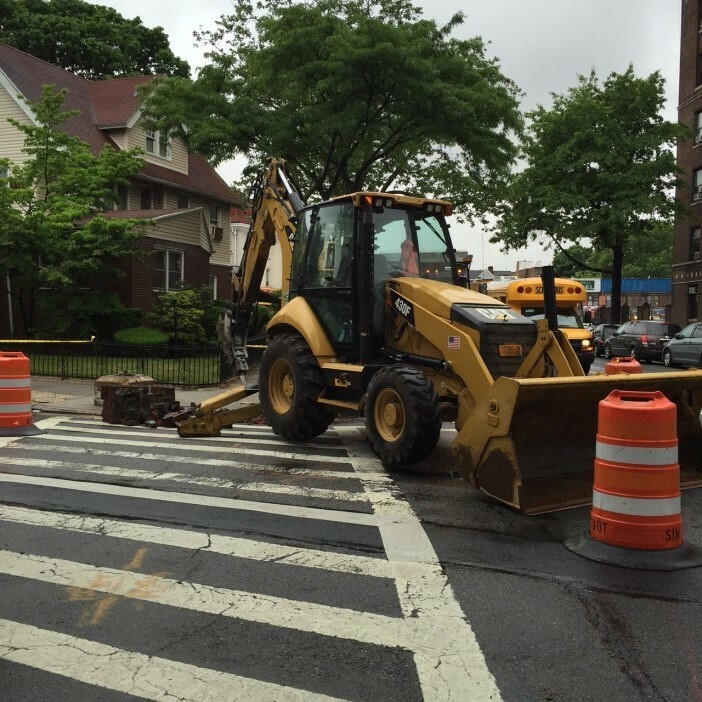 In June, the New York City Department of Transportation demolished the twin brick columns at the corner of Foster Avenue and Westminster Road which had stood since 1925. The demolition was conducted in error and elicited anguished howls of protest by Argyle Heightsians, shocked that their government could act so quickly and efficiently to accomplish its mission. What could be next? The bull-dozing of the land-marked Avenue H subway station to build another drug store? Fearful that Argyle Heights and its rich cultural history of Halloween Parades/Displays, Progressive Dinners, and Dekoven Brunches might secede from the Union, the City mobilized all its resources and erected replacement columns in early September. Although we have written about these historic totems in our series on the history of West South Midwood (see argyleheights.blogspot.com/2014/12/the-part-two-stroll-down-west.html ), we have not told the entire story, which we will rectify right now. The first pillars in these parts were built in 1905 by the Prospect Park South Association, which embedded a fancy “PPS” masonry filigree on the columns (a backwards “P” followed by an “S” and a regular “P”), with decorative flower-filled urns atop a pedestal bearing the street name. A nice useful touch that, back when street signs were not affixed to poles at every corner. These columns marked the quadrant that extended from Church Avenue to Beverly Road and from Coney Island Avenue to the Brighton line. Of course, we here in hardscrabble Argyle Heights have always prided ourselves on being the workingman's alternative to the uptown PPS mansion owners, a stance harder to maintain as our own property values soar into seven figures, but still, our stanchions never had initials or street names. Those letters would have been WSM for West South Midwood, and would have served as a daily reminder of our existential dilemma – naming our neighborhood in relation to its geographical location at the western end of the huge South Midwood land sale by the Lott family in 1900. Why not name it for what it is, an up-sloping ten acres of Victoriana, redolent with feral cats, raccoons and opossum: Argyle Heights. Or Rugby Ridge. Or Wuthering Westminster. Miracle on Argyle Road? US Postal Service Delivered This Letter From Vermont to My Home. Ergo, Argyle Heights Exists. Anyway, PPS had to obtain permission from the Borough to plant its pillars and used this benediction to later successfully battle an attempt to re-name portions of 15 th Street and Coney Island Avenue as Prospect Park South. Why? 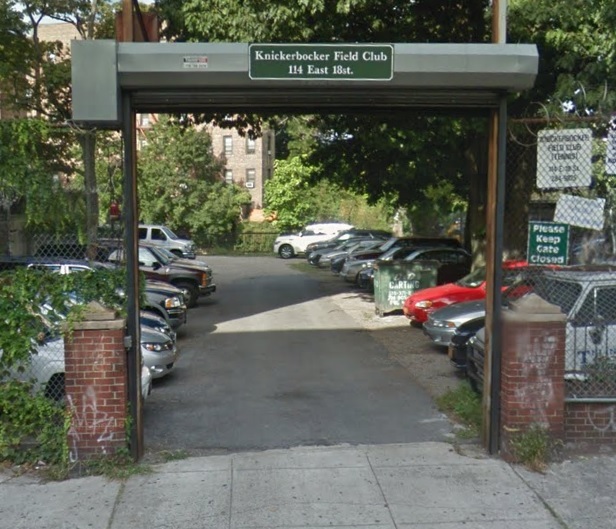 Because the name Prospect Park South had already been taken, Borough dudes – look at our posts! 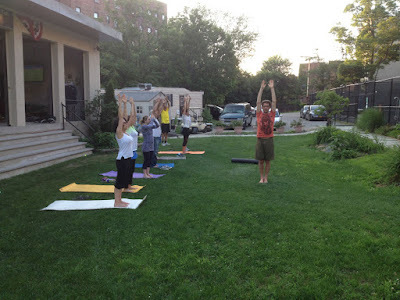 The Prospect Park South Association suggested Prospect Park Terrace would make a nice name for that stretch of road from Bartel Pritchard Square to the roundabout along the Parade Grounds. B ut the Borough fathers, in a decision that only added to the confusion, settled on Prospect Park South west . Of course, when traveling north to Park Slope, this street should really be called Prospect Park North west. These naming decisions help to explain why many Brooklynites remain perpetually confused about our geography, what with South Midwood being North of Midwood and South Brooklyn located in the Northwest region of our fair county. 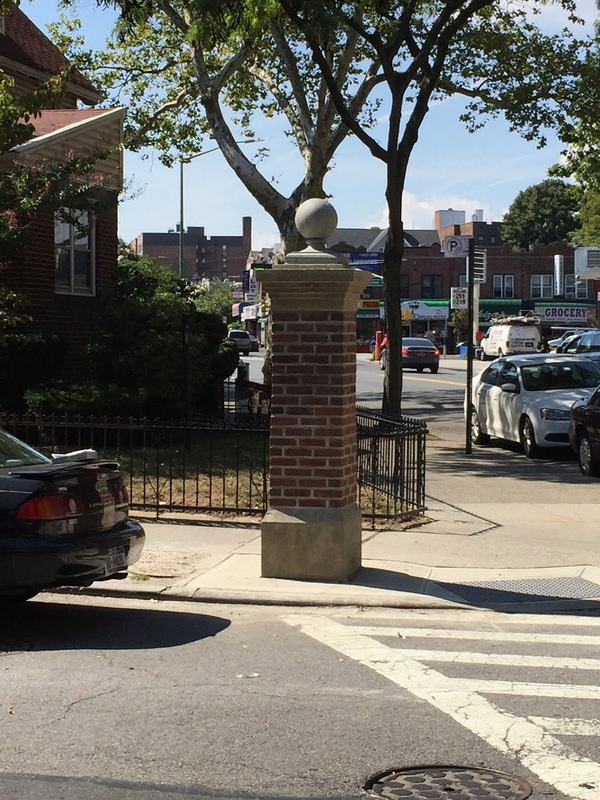 Moving on, in 1909 our immediate neighbors to the east of the Brighton line in Midwood Park and Fiske Terrace decided to erect their own ornamental pillars. Each neighborhood had its own property owners association but realizing the bureaucratic nightmare that loomed, appointed a joint committee to oversee the building of 11 structures, all sporting urns with flowers. 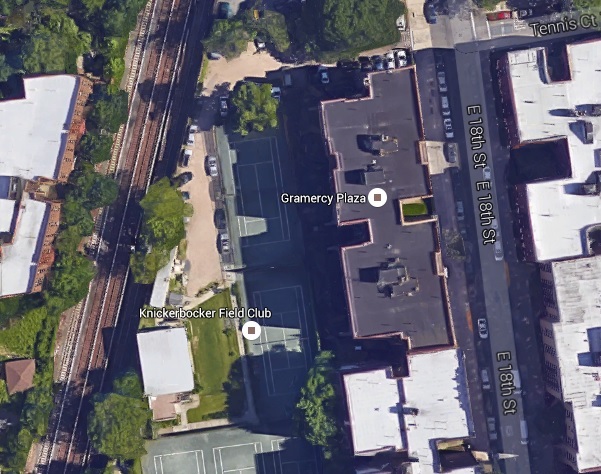 The locations for these markers would be along Foster Avenue (at E. 17 th , E. 18 th & E. 19 th Streets), and on Ocean Avenue at Foster, Avenue H and Glenwood Road, then called Avenue G, a name which still survives on the existing pillars there. Of interest, the impetus for these columns was the erection of apartment houses and store-fronts along the north side of Foster Avenue in 1908-1909. 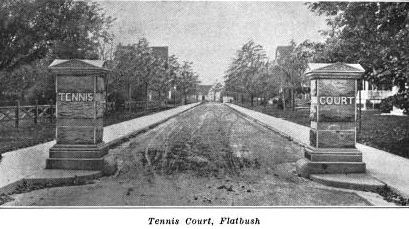 As The Brooklyn Eagle reported, citizens wanted “a line of demarkation...along Foster Avenue as a sort of notice to everybody that 'thus far and no farther' could apartments be built.” Contrary to some unfounded assertions on the Internet, however, neither these nor any other Flatbush stanchions were ever gated. They were merely ornamental. 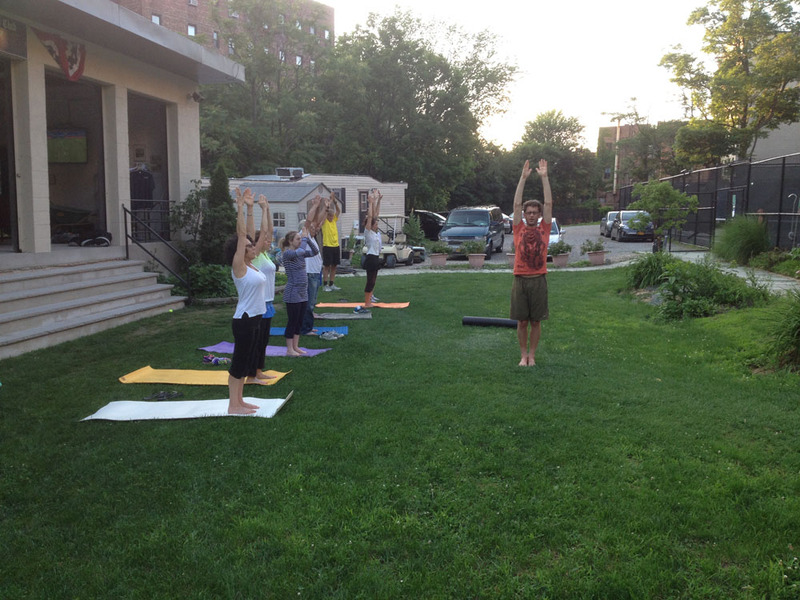 The community committee, however, first needed to secure permits from: the Flatbush Board of Local Improvement (APPROVED! ), the Board of Estimate & Apportionment (APPROVED! ), and finally the Municipal Arts Commission (REJECTED!). Huh? It seems the Arts folks decided to get all sorts of innovative and decreed they would only approve pillars that featured electric lighting on top instead of urns. The Commission reasoned that the pillars, once erected, became City property, and why not make these ornate columns the vehicle for street lighting rather than what it considered to be ugly city light poles. The committee, exhausted by a year of letters, forms and meetings, and now seeing light at the end of the tunnel, at that point probably would have agreed to anything short of placing dancing bears in cages on top of the stanchions. And so what was originally estimated to be a $1,200 project that ballooned to $1,700 now required property owners to pony up $2,000. Whereupon, the pillars were erected, with space for electrical connections therein. All that remained was for the Superintendent of Light & Power to install the lights and...REJECTED! The Superintendent instructed the Deputy Commissioner of Water Supply, Gas & Electricity to pull the plug because the “three tungsten lamps per post” required would be far more expensive to supply than the existing arc street lighting. Anguished cries erupted from frustrated Fiskians while only crickets could be heard emanating from the Municipal Arts innovators. The Eagle reported on the rejection: “The residents of Midwood Park and Fiske Terrace are so shocked...that they don't know what to do next.” Rather than rise up and revolt, they removed the electrical connections, and the urns they had originally proposed were substituted for lamps. Remarkably, nine of these stanchions are still standing tall – a single pillar on the southwest corner of Foster & Ocean Avenues, which once marked the boundary of a polo field, and one of the two pillars at Avenue H are gone. And only one post is missing an urn – on the northwest corner of Glenwood & Ocean. 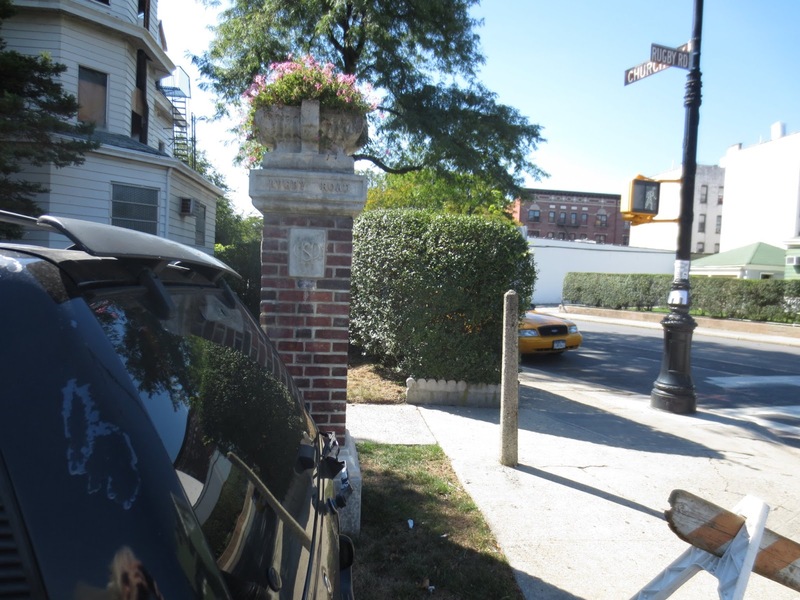 These stanchions, once they appeared throughout Flatbush, seemed to become magnets for runaway motor vehicles. 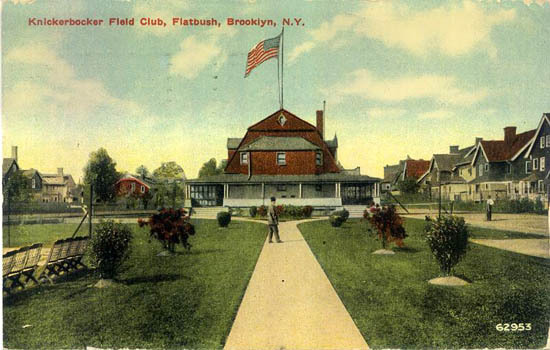 In March of 1920, the Midwood Park Property Owners Association had to increase its membership dues in order to repair a decorative column on Foster Avenue that had been damaged as the result of a collision between a mail truck and a touring car. 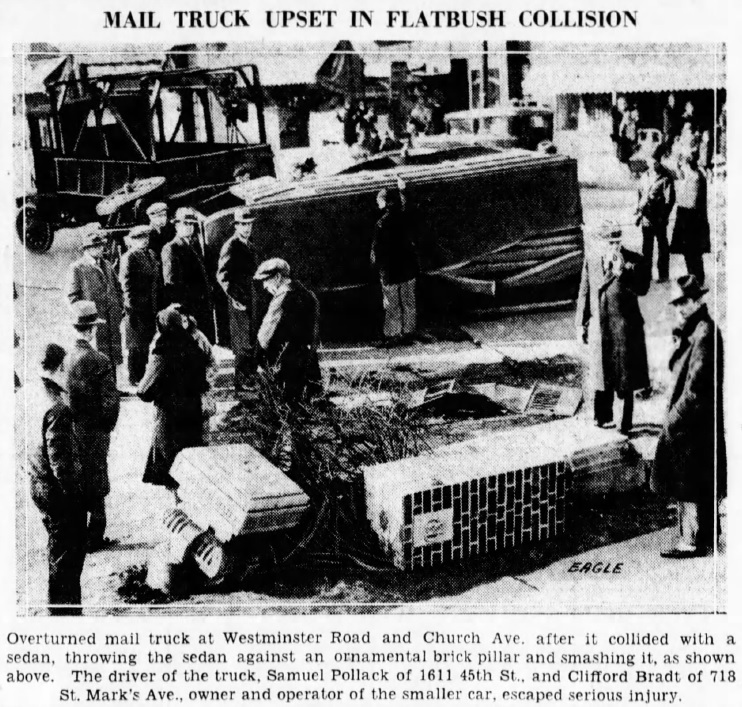 In January 1931, one of the Prospect Park South pillars at Westminster Road and Church Avenue was completely toppled when another mail truck collided with a sedan. And many old time Argyle Heightsians will recall the toppling of a stanchion at Rugby Road and Foster Avenue as the result of another vehicular accident. When that column was repaired, a time capsule was inserted into the base of the stanchion by the West Midwood Community Association. 25 years later, its contents would probably now seem very quaint since that was a much simpler time when houses didn't suddenly burn down at four in the morning. Given that yet another pillar, at Argyle and Foster, was damaged by government contractors in late October, it seems likely we'll be able to examine that Rugby Road time capsule real soon. 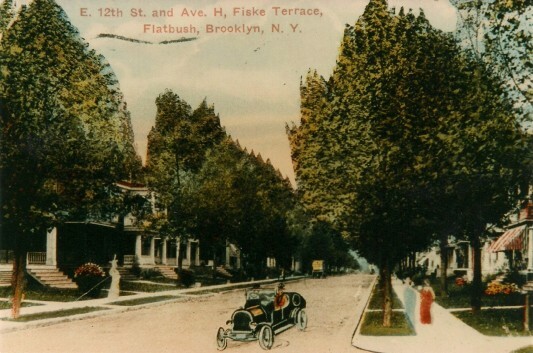 1909 Postcard Calling Us "Fiske Terrace" Because "West South Midwood" Was Bor-ing. This Northwest Corner of Westminster Road & Avenue H Did Not Become Pillarized Until 1925. COMING SOON: Yet More Historic Tidbits Including "Oak Crest", Food Co-Ops, and a Movie Theater on Rugby Road? Noooooooo! Hey! That's my mail cover! But I could have sworn that I asked Ralph at the Post Office to hand cancel it, so it would show where it was mailed. All mail up this way is trucked north to White River Junction, sorted and sent from there. Of course, I later fessed up to Ralph, but he kept his poker face on and just said if I did not address it correctly it would be delayed. Thanks, Bob. But your letter addressed to Argyle Heights was not delayed at all. As I recall your historic missive stated: "What hath a desire to boost property values by embedding elevation into a neighborhood's name wrought?" Inspiring prose. Note that in addition to the photo you pointed out, I located another as described therein.